Do you focus on capturing product stories or customer-hero stories? The answer can make a huge difference in your sales and marketing results. Despite all the time, money, resources spent on improving sales productivity, just 13% of salespeople produce 87% of revenue in a typical organization according to the Sales Benchmark Index. So, what do the 13% high achievers have that others don’t? They connect emotionally to their buyers. That’s why interviewed Mike Bosworth. If you don’t know Mike Bosworth already, he is a thought leader in the sales space. And he’s had a profound influence on how we sell and market, especially those who are in B2B. 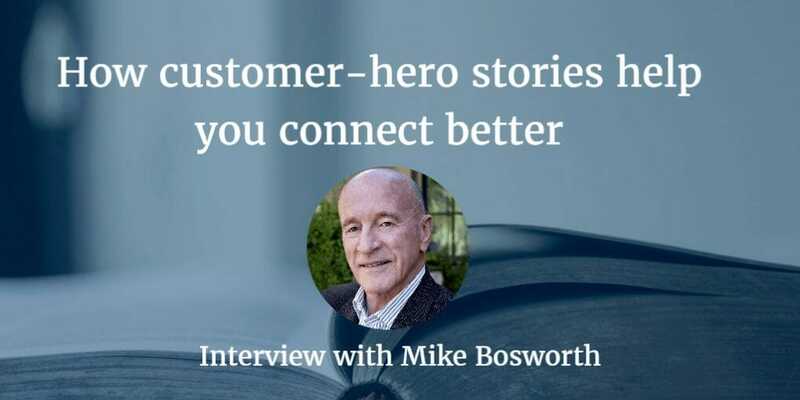 In this interview, we talk about the power of customer-hero stories to connect emotionally with buyers to facilitate their buying journey. Mike: Well, it’s interesting because, I think today, it’s incredible how cloud technology is forcing companies to be more empathic in their sales and marketing. It’s forcing them to. Because with the cloud, the conversation has to shift from the old “our-solution” marketing: our solution will do this, and our solution will do that. So, making that shift from that to how-the-customer-uses-our-stuff marketing: customer usage marketing or what we in Story Seekers call customer hero marketing. I want marketing to think about what are we really doing marketing for– I’m hoping we’re trying to create customers and sales is also trying to create customers. If we’re going to sell empathically then, ideally, we won’t even be “selling”. We’ll be facilitating the buying journey of our customer and facilitating their customer experience because human beings love to buy, and they hate to feel sold. What inspired you to talk about integrating with marketing and sales? Well, for my whole career as a sales productivity consultant and sales trainer, my stated mission was to help my client lift the bottom 80% of their sales force. The top 20%, the ones who bring in 80% of the revenue, they’ve been doing well for years and continue to. I figured I want to help my customers bump up at least the next 50% because if you could get a 10% increase in productivity from that next 50%. Do the math on that for most companies: it’s a lot of money. Brian: It is. As you’ve been working with companies and clients, there’s something that’s existed longer than probably both of us have been doing our work. Tell us the things most important for marketing and sales to agree on? In most companies I deal with, they’re really two different silos and they’re pointing fingers at each other. Marketing thinks they’re sending these great leads to sales, and sales, they go into a black hole and then there’s no follow-up. Sales thinks that the leads from marketing are coming from the janitorial staff of the company that they’re selling to. Quite a while ago, it occurred to me that if we can find the touch point in integrating sales and marketing, we could really help things out and so Tim Riester and I, we dove into it, and we’ve made the touchpoint, the definition of a lead. If both the chief sales officer and the chief marketing officer can specifically agree on the definition of a qualified lead then the “integration” really starts getting a lot easier. That word integration is messing people up in this day and age, and, if you think about it, it gets most people thinking about IT issues. APIs, and what plugs into this and what feeds into that, and that’s disabling true integration. A couple of weeks ago, I just swapped out the word integration for agreement. Golly, does it seem to simplify things. If sales and marketing can agree on a finite number of things, great things can happen. Brian: I really love the word agreement and I think that’s the challenge. Without an agreement, we don’t have common ground. I’d love to hear from you and I think a lot of people have lead definitions. I wrote about the universal lead definition in my book. What’s the definition of a qualified lead that sales and marketing should agree upon? What buyer personas are we selling to? Who do we envision our best customers to be? Where we can help them be a hero? Where we can help them achieve a goal or solve a problem? Back in my Xerox days, we were selling manufacturing productivity improvement software so we were selling to buyer personas. One buyer persona would be a VP manufacturing who’s missing his shipment schedule. Another one would be a materials manager had shortages and another one would be a CSO who’s missing his sales forecast. Once you have those buyer personas targeted, now, we go in and think what psychological buying process would they go through in their organization, and when would they start bringing in other people and how would they share information and all that stuff. Ideally, if we can help our customer buy, they never feel any pressure from us. My philosophy has always been: we’re trying to facilitate the buying. A study by Sales Benchmark Index of 1,100 of B2B sales forces came back in 2008 and they found in their case study base that 13% of the salespeople brought in 87% of that revenue. I felt like I’ve been kicked in the stomach because my whole mission was to help the bottom 80% get better and it had gotten worse and that caused me to go into a breakdown of a bit. I started studying the problem, and in most cases, 80% of the people in sales aren’t very good at building an emotional connection and building trust with a stranger in a short amount of time. They’re just not very good at it. They end up diving into their solution or their technology or their knowledge or their discovery questions before the buyer trusts them enough to allow themselves to be questioned. If you think about why they quit using it (and my intellectual arrogance caused me to not really study it as well as I should have) it’s that inability to intuitively connect and know when you’ve built enough trust and connection that you can get out your listed discovery questions, and with solution selling, the bottom 80% lack the intuition. They went to their discovery questions too soon, prematurely, and the buyer said, “You don’t know me well enough to ask me all these questions” and pushed them away, and so if you’re pushed away for two weeks, you quit using it. Brian: As we’re talking about the definition, I wanted to go back. Mike: I went off on a tangent because it was the prerequisite of a qualified lead. Brian: We have to know it. I agree. Mike: A named targeted buyer persona (John Doe at the ABC company) is curious how we helped a peer job title, another whatever, chief accounting manager at another company, achieve a goal or solve a problem. We have somebody curious how we’ve helped their peer. He reiterated his experience of getting a “lead” of someone who didn’t actually want to talk with them. They weren’t curious. They were someone who had agreed to a meeting, but they didn’t know why. Mike: Agreeing to a meeting. They might have been curious that we didn’t capture that curiosity. Brian: Earlier you talked a bit about the problem with product marketing and you brought up customer hero marketing. Why should we in marketing start focusing on making our customer the hero, instead of what we’re doing right now which is focusing on the product or what we do or what we sell? What are customer-hero stories and why should we focus on them now? Mike: First of all, it is going to be the mission of the company to do customer hero selling and customer hero marketing? It really has to come from the top. It’s really a paradigm. Years ago, Gerhard Gschwandtner, the publisher of Selling Power magazine, said that the CEO’s definition of selling is the DNA of the customer’s experience. If you really believe in your heart that people love to buy and hate to be sold, then why wouldn’t we make it our mission as a company to facilitate, to architect, our customer’s experience? To really think about how they would go through a natural buying process and feel comfortable and then let us facilitate that buying, using storytelling and story tending. Thus, making story the foundation because stories allow people with problems to visualize seeing themselves solve that problem. What happens is we create a little story in their brain. And the story involves seeing themselves responding to that once a month problem they have differently, if they just had somebody’s help or technology or capability. The customer is a hero by using the product and so let’s not market the product as the hero. Let’s market our past customers as the hero and we’re looking to help new prospects become heroes via customer hero selling. If we really agreed on the definition of a qualified lead, now customer hero marketing feeds right into the customer hero selling. Brian: I love the definition and distinction because, I know from the customer’s side, they’re curious about someone like me who’s had a problem like me and I think that is the challenge that we have, bridging that gap of trust. What can marketers and sellers do to apply empathy and better connect with customers? Mike: It’s such a paradigm shift. What we’re trying to do is teach salespeople to create a big juicy buying vision, a customer hero vision where this guy sees himself as a hero in his own company. Saving money, making money, solving a problem, achieving a goal, that he hasn’t been able to do before. We teach people how to do connective-listening. Once the buyer starts talking freely. We teach the salespeople how to tend the buyer story and then send that buyer a written version of his customer hero story. Brian: As I’m listening to you, it sounds like you’re building a relationship by helping someone else relate to the story, see themselves in it, and then also starting to bridge the trust gap because you’re connecting with something that they can identify with and how they’re likely feeling. Mike: It’s the product usage. That’s why the customer hero stories bridge the cloud gap now too, or the cloud is forcing all these technology companies that have all this high-powered product marketing talent and most of the product collateral ends up being “it” based or “our solution” based. It will do this, it will do that, or our solution will do this or our solution will do that. That’s making the product the hero. It’s disabling the buying process because now the buyer is going to feel the pressure of somebody wanting to sell them some piece of technology. Who should own lead generation for a complex sale?